Meanwhile, Italian Serie A high-flyers Lazio came from behind to win 3-1 at Nice, after Mario Balotelli had opened the scoring. LYON PILED THE pressure on Everton manager Ronald Koeman with a 2-1 Europa League win at Goodison Park on Thursday, while Olivier Giroud’s acrobatic late strike snatched Arsenal a 1-0 victory over 10-man Red Star Belgrade. Nabil Fekir’s penalty put French side Lyon ahead early on as Everton struggled for inspiration with Wayne Rooney rested and watching on from the stands. The crowd only really got behind their team when a mass brawl broke out between the players in the second half after skipper Ashley Williams pushed over Anthony Lopes as the Lyon goalkeeper jumped to catch the ball. The Wales international was lucky not to see red as he also appeared to land blows on several players, while some home fans tried to get in on the action by leaning over the barriers. The incident is unlikely to go unnoticed by UEFA, but Williams brushed it off by powering home a header from a Gylfi Sigurdsson free-kick just minutes later. But Lyon were the better side and retook the lead through Bertrand Traore’s clever finish. Everton now turn their attentions to a home Premier League match with Arsenal on Sunday, where anything other than three points would put Koeman’s position under even more scrutiny. The Merseyside outfit, who have only won two Premier League matches in eight games this season despite significant close-season transfer investment, remain bottom of Group E on one point after a winless three games. Italians Atalanta top the standings ahead of Lyon after seeing off Apollon Limassol 3-1. Captain Fekir put Lyon ahead in just the sixth minute from the spot after a rash tackle from Everton full-back Mason Holgate on Fernando Marcal. The hosts finally created a chance as Kevin Mirallas was denied by Lopes after a clever pass from Tom Davies, before Lyon almost doubled their lead when a long-range Memphis Depay free-kick struck the crossbar with the aid of a deflection. After Williams’ crazy spell ultimately dragged Everton back into the game, they were hit by a sucker-punch as Burkina Faso forward Traore gave Bruno Genesio’s Lyon a deserved victory with a backheeled finish from Maxwel Cornet’s cutback. Goalkeeper Jordan Pickford spared Everton further embarrassment with a string of late saves. Earlier on Thursday, Arsenal rode their luck at times in an uninspiring performance, before Giroud struck in the 85th minute after Red Star had seen Milan Rodic sent off. Arsenal took advantage in style with a wonderful goal, as Jack Wilshere’s clever flick was turned across goal by Walcott for Giroud to send an overhead kick spinning into the top corner. The Premier League side stay top of Group H, five points clear of Red Star, after three straight wins. I said yesterday in our press conference I don’t think anyone can question our character, we showed that tonight,” midfielder Jack Wilshere told arsenal.com. The Italian capital-city side took top spot in Group K and extended their unbeaten away run in the Europa League to 11 matches as midfielder Sergej Milinkovic-Savic scored a second-half brace. But seven-time European champions AC Milan continued to struggle as they were held to a 0-0 home draw by AEK Athens in Group D.
Email “Lyon beat Everton to pile pressure on Koeman”. 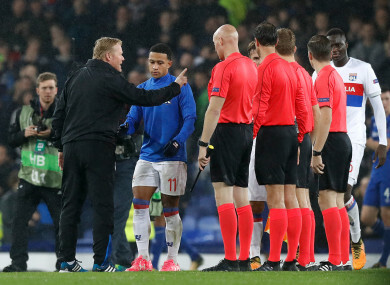 Feedback on “Lyon beat Everton to pile pressure on Koeman”.